Back in August of 2010, my daughter started her freshman year of college, and I joined LinkedIn to help students make more informed – and inspired – decisions at every critical career milestone. Fast-forward four years: My daughter and many of her friends have graduated from universities across the country. A few have landed great jobs, but most are wondering what to do next, and which choices will lead them closer to the futures they dream about. My daughter and her friends are not alone. If you’ve followed the news lately, you’ve heard about the great challenges in education and youth unemployment. The media is full of stories about abysmal college graduation rates, astronomical student loan debt, the difficulty graduates have paying back student loans, and the “skills gap” between the jobs employers have right now, and the skills of today’s graduates. So whether deciding where to attend college, or figuring out how to launch their careers after graduation, students and graduates today face difficult decisions with few reliable resources to help them navigate this rapidly changing environment. Today, LinkedIn is introducing new tools designed to help students overcome many of these obstacles. These tools combine data-driven insights based on the career paths of LinkedIn members, and social features so students can get guidance from trusted advisors and professionals who have walked in their shoes. Taken together, they offer a new way for students – and people who care about them – to navigate one of life’s biggest decisions: choosing where to go to school and what to study. Finding the right fit is about matching students – each with their unique strengths and interests – to the specific environments where they will thrive. It’s a complicated process – and Decision Boards were designed to make it better. Using a combination of organizational, social and insight tools, students can “work the problem” from start to decision. Students can share their evolving thought process with trusted advisors, and meet future classmates for inspiration and commiseration. Which schools are best at launching graduates into desirable jobs? We analyzed millions of alumni profiles to find out how universities stack up across a variety of careers. 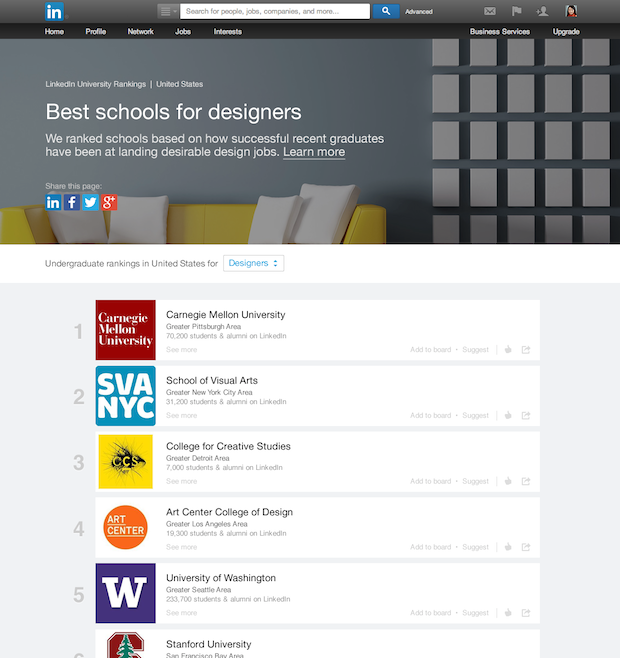 Then, we ranked schools based on how successful their recent graduates have been at landing desirable jobs as designers, software developers, investment bankers and more. These are the first rankings using alumni career outcomes to rank schools for specific careers. We are just getting started with University Rankings - more categories and countries will be coming over time. 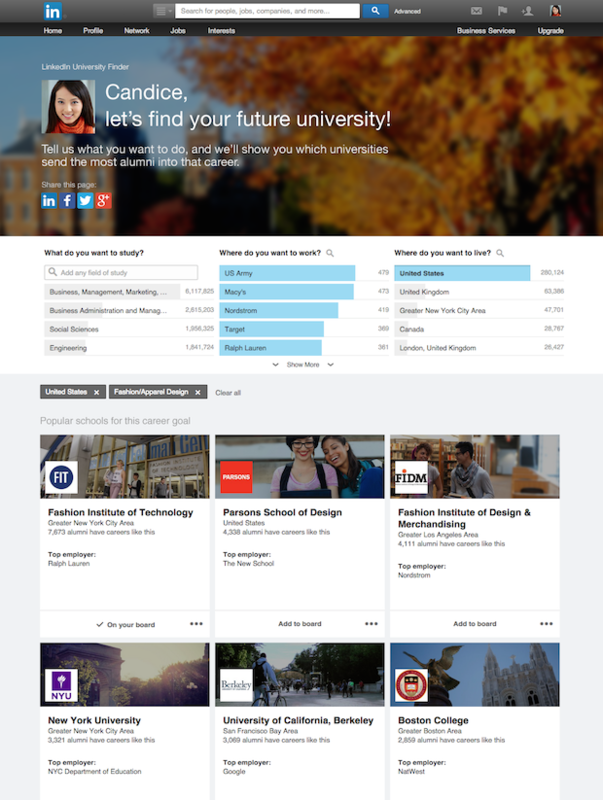 For a more personalized experience, University Finder allows students to imagine future careers, and then see schools most attended by LinkedIn members already working in the career selected. By clicking the interactive graphs, a student can try out a possible career: “I’d like to study engineering, then work at Google or Apple, and live in the SF Bay Area after graduation,” then see school results update with every click. This journey didn’t happen overnight – and products we’ve shipped in the past few years are key components for prospective students. In addition to these new tools, check out the Field of Study Explorer to discover majors you’ve never dreamed about and see the wide range careers LinkedIn members achieved based on what they studied; and University Pages to learn more about more than 25k schools worldwide. 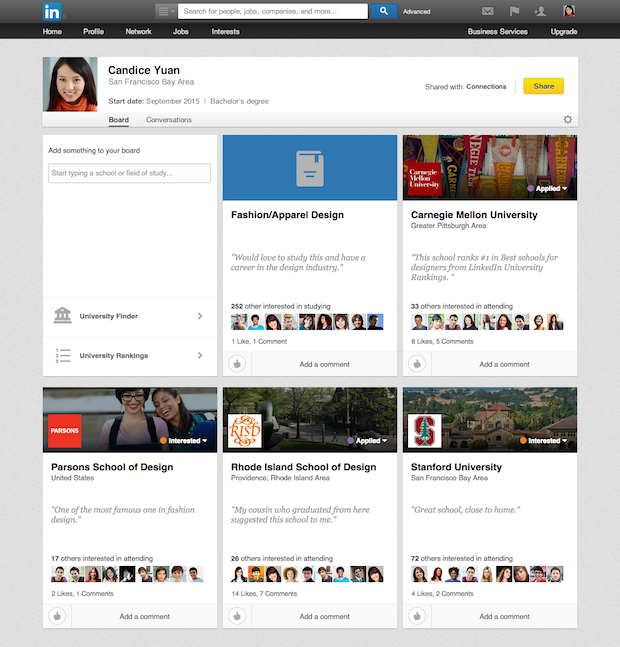 Learn about all of LinkedIn’s products for students at linkedin.com/edu. If you aren’t a prospective student now, odds are you know someone who is – maybe your child, a younger sibling, or even a colleague thinking about graduate school. LinkedIn was built based on the belief that relationships matter for successful, satisfying lives. Over the years, we’ve heard many stories about how a person who offered the right advice at the right time changed the trajectory of someone’s life. It happened to me – a high school teacher looked at my list of colleges, told me I’d be miserable at all of them, and suggested Carnegie Mellon. 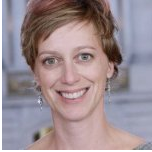 I applied at the last minute, was accepted, and loved it there – enough to go back for a master’s degree. One conversation changed the course of my life – and set me on a fabulous career I would never have imagined. As a successful professional, you have enormous power to help the next generation succeed. Reach out and lend them a hand. Suggest universities or fields of study you think might suit them. If a student shares their Decision Board with you, take a few minutes to see what they are thinking, add your comments, and answer their questions. Invite them to connect and introduce them to people who might be able to help – maybe a colleague who attended a school they are considering. The best way to “change the world” is to help the next generation get a great start on the path to pursuing their passions.